September is always a busy month for BART with fieldwork and river restoration, and this year was no exception. As we need to avoid the trout spawning season which begins in October, September is always jam packed with long days out on the river and we have definitely been making the most of it! 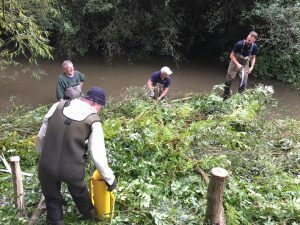 Over the weekend BART have been doing river restoration with the Friends of Biss Meadows Country Park in Trowbridge. They are a community conservation group formed of dedicated volunteers who protect the plants and wildlife at the country park. They also run wildlife walks throughout the year and have monthly working parties so are kept busy all year round! 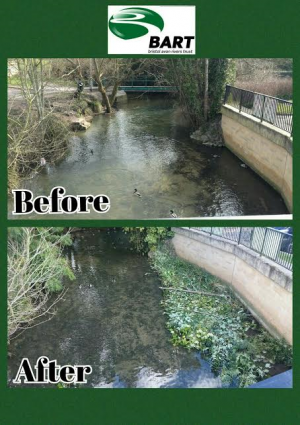 Working together with the Friends group and other volunteers we restored in-stream habitat diversity to a section of the River Biss, which created a more diverse flow within the river channel which had previously been overwidened and overstraightened. The berms which the volunteers built will create new areas of habitat by forming shallower bays which will gather sediment and form new areas of bankside, as well as faster flowing sections of the channel which creates flow variety. 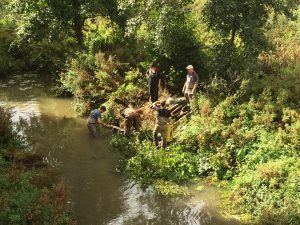 The team built woody debris structures out of coppiced tree limbs which are then fixed into place by the bank using chestnut stakes. The tree limbs are angled into the channel and brash cut from the tree limb fills in the structure from the bankside. These structures will provide refuges for juvenile fish as the river slows as it flows through it, and acts as a nutrient trap where the water is warmer which again gives juvenile fish a helping hand in finding food. The structures also trap silt which would otherwise be suspended in the channel, and promote scouring of silt from gravels on the riverbed which is essential for fish spawning. 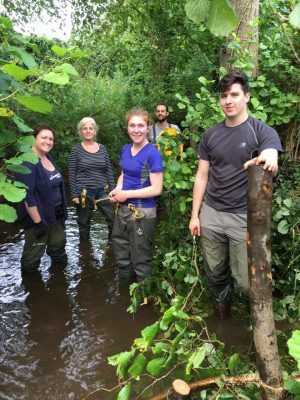 The conditions were pretty tricky to work in with deep water full of silt after the recent heavy rain, so an extra well done and thanks to all the volunteers and the Friends of Biss Meadows! 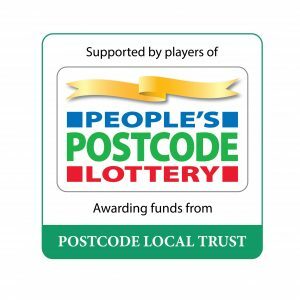 Thanks to People’s Postcode Lottery‘s Awards for All for funding this project with Friends of Biss Meadows Country Park. 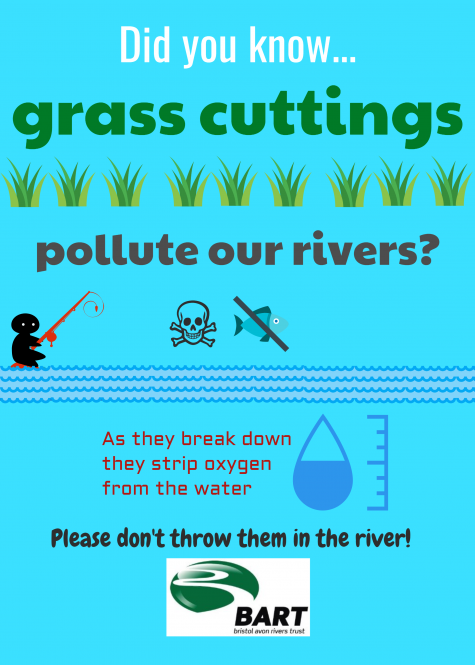 While we’ve been out on the river recently we’ve noticed many occurrences of people throwing their grass cuttings over their garden and into the river. Please help us to spread the message that this pollutes our rivers by sharing this poster… thank you! So here we are in September, our busiest month of the year for in-stream habitat improvement works and it feels like just yesterday we were finishing up our works on the Bristol Frome at the end of February. How quickly has that Summer (or lack of it!) flown by!? We conduct most of our in-stream habitat work, which largely involves adding woody materials to rivers, before October to avoid the trout spawning season (October to March), where any disturbance of sediment may affect egg survival. By avoiding this season, we can be sure that our habitat work only has positive impacts on juvenile fish recruitment. This is different for coarse rivers whose ‘closed season’ is 15th March to 15th June inclusive. We are extremely lucky to have received funding from multiple funders (HDH Wills, People’s Postcode Trust, the Bristol Avon Catchment Partnership and the Environment Agency) to deliver habitat improvement works along a significant length of the Wellow Brook over 5 weeks. These improvements are taking place around the areas of Midsomer Norton, Stoney Littleton and Wellow. Fish cover for juvenile fish, reducing predation by larger fish, birds and mammals, increasing recruitment rates and therefore population numbers. The formation of shallow bays which act as warmer water nutrient traps and escape from faster flowing waters, providing essential food sources for juvenile fish and further increasing recruitment. Acting as silt traps to reduce turbidity within the water column and reduce fish stress, therefore improving survival. Increasing areas of shade within the river to mitigate for warmer waters (and therefore reduced oxygen content) from climate change. An example of woody debris habitat creation from last years work on the River Marden, Calne. These works simply replicate the processes and benefits that occur when a tree falls into the river, but in a way that ensures no unwanted erosion or enhanced flood risk. Over time, silt in the river will accumulate on the structures, they will vegetate and they will form part of the bankside in a more natural, meandering form than before the works. This method is much better than hard engineering works using man-made materials as it creates more diverse habitat, is more natural, requires less carbon dioxide to produce, is cheaper and provides an extra win of coppicing overshaded rivers. We are also pleased to announce that we have been selected to go forward to the Tesco Bags of Help public vote, where Tesco customers around the Bath area will have the chance to vote to extend these improvements to the urban section of the Wellow Brook through Radstock. This will provide a crucial link to join up our habitat improvement works, which will result in further enhanced fish populations. More information here. 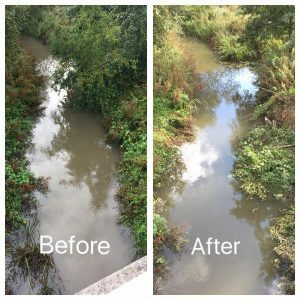 These works are part of our larger Wellow and Cam initiative which is taking a catchment approach to improving the length of the Wellow and Cam Brooks. 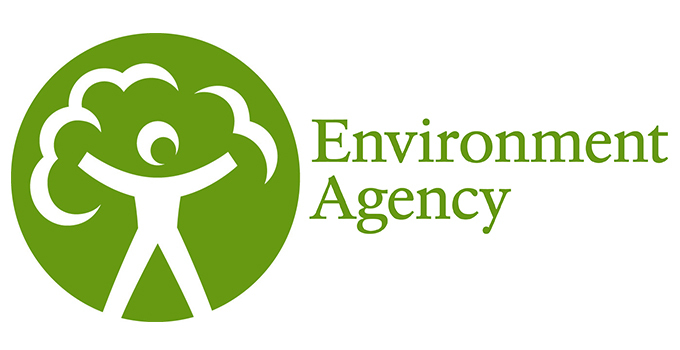 Other upcoming elements to this initiative include fish passage investigations later in the year, landowner meetings and farmers lunches to discuss how we can work together to reduce diffuse pollution levels in the area. We are very grateful to those people who have already volunteered with us on this project and those of you who have signed up to volunteer over the next 5 weeks. A massive thank you is also due to our funders HDH Wills, People’s Postcode Trust, the Bristol Avon Catchment Partnership and the Environment Agency for funding these works!